A reliable technical indicator, called the death cross, reveals a market downturn is coming soon. The death cross occurs when the 10-month moving average crosses below the 20-month moving average. In the past twenty years, this has only happened twice, in 2001 and 2008. Both times the stock market crashed soon afterwards. The chart below shows 20 years of stock market price movements with the red line showing the 10-month moving average and the green line showing the 20-month. In late February 2016, the death cross appeared when the red line dropped below the green line. The chart was provided by businessman and market investor Aaron Brickman. Aaron has studied historical patterns in major market crashes and used his findings to successfully trade the market crashes in 2001 and 2008. Each bar on the graph represents one month of data. Click on the image to see a larger version. The appearance of the death cross shows the end of a long-term bull market and the beginning of a new long-term bear market. In the short term, it indicates we could see serious selling in the stock market. After the appearance of the death cross, markets have historically followed a pattern of bouncing back up to the 20-month average, which is referred to by technical analysts as an underside retest or a kiss-back. Although it is an upward movement, it is consistent with bearish patterns. When the 10-month average fails to move back up above the 20-month average, the test is failed and the bear market accelerates. 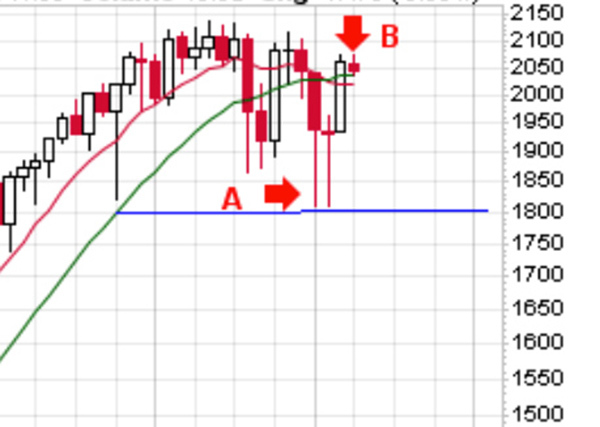 In 2001, the underside retest occurred from December 21 2000 (Point A) until January 31 2001 (Point B). Over the next 37 trading days, the market dropped from Point B to Point C, which was a -22% drop. In 2008, the same pattern was followed. The underside retest occurred from May 19 (Point A) until July 15 (Point B). Over the next 40 trading days, the market dropped from Point B to Point C, which was a -17% drop. The same pattern has repeated in 2016. As shown in the graph, the market dropped down to Point A, which is also the support level, indicated by the blue line (S&P 1,800 and Dow 15,480). It then bounced back up to Point B, reaching a top on Friday April 1 2016, 2,075.07 in the S&P and 17,811.48 in the Dow (intraday). The move up to Point B also formed the final leg of the triple-top reversal (W-pattern), which is another bearish pattern. If this pattern continues, we can expect to see a drop of 17% to 22% over the next 37 to 40 trading days, which would translate into the S&P dropping to about 1,618.55 to 1,722.31 and the Dow Jones dropping to about 13,892.95 to 14,783.53. The target dates for reaching the bottom would be May 24-27. These projections are based only on the historical patterns without consideration of any other factors. If we continue following the historical pattern, the market will soon begin testing the support level (blue line) and will eventually break through it. The new bottom will become the next Point C. Regardless of how far down it goes, there will likely be a one or two month pause, as shown in 2001 and 2008 when the market rallied back from Point C to Point D. The rally makes a final underside retest of the 10-month moving average. If that fails, the bear market then accelerates even faster. These historical patterns are consistent with prophetic warnings about a market downturn beginning during Passover. There are also reasons to believe the 2016 drop could exceed 2001 and 2008 due to increased sovereign debt levels and increased exposure to derivatives in our financial system. Well worth looking at the themes in these comments here when the death cross last came up. James – April 16 recounted a short vision ‘I heard the opening bell for the markets already deep into the red before the opening. It was way to late to get in for anyone who was not already in a short position…. (just happened to read his at 12.30, the time he posted it…try explaining coincidences to a Jew.. They were talking about Death Cross. Below please see the link. Thanks. I was very surprised to see FAZ drop below $38 at the opening as I thought $38 would be the lowest it ever gets again. However…my hope is that you got in first thing! Blessings to ALL Z3’er family today! Keep the faith….God is good all the time! March 1, 2017 FAZ 17.16! $38 Lowest it ever gets again? But as it has been reckoned, the symmetry to the number could indicate other implications. I’m not much into numerology, and meanings of numbers, but I have been endowed with a word of knowledge in regard to the date 11th May 2016. 38.83 in this light looks like an inference to that appointment. 3+8, 8-3 is 11, 5 or rather 11th May and the double 8 sums up to 16. Just messing around with figures…. But not on the appointed date of 11th May 2016. I’m persuaded the day will manifest the appointed time. Another interesting number I came across on the 19th April, was the earthquakes in Japan. At 00.47UTC there was a 4.8 magnitude earthquake at the about the Kumamoto area. Incidentally, in the African tongues of my ancestors, Kuma means to emerge, and moto is for fire. The location name infers emergence of fire. The numbers 47, 4.8 are indicative of the mystical number 47, where 48 is usually tallied to 47. Its a number of earth defense -Divine judgement that I’ve come across over the past couple of years. The sign of the number manifests in cases where natural earth law has been violated, and death follows in retaliation. (Sorceress also subvert the number to their selfish ends. In the case of the Japanese earthquake today, its indicative of the nature divine judgement is shaping to rectify violations against the planet. Japan is industry leader in fire technology a automotive industry, which to a large extent has distabilised the elements and renders the planet at great risk of self destructing. Z3 family it just came to me to add the Faz numbers that Francy saw at 38.83 . I have wondered why that number the same forward and backwards. 3+8=11. 8+3=11. I looked up 11 in biblical numerology it represents disorder ,chaos and judgement. James has been talking about a decline in the markets and then another after that. Could this be the double drop in numerical code? There is the concept of a chiasm in Scripture that seems to fit. If the message AB is emphasized, it is written as ABBA. ABC would be ABCCBA. The Shemitah last year was a possible example. It was 5775. Thanks for sharing these things Lee. The more little pieces of the puzzle we get the clearer the picture becomes. Thanks Ed – I definitely caught that comment as well and was very excited to hear it – there are definitely a number of folks with expertise forecasting a downturn that is now days away. Well Jemba, you got your wish. It opened only slightly down. Is there a way to ask you questions/thoughts not on the forum? It would help me. I did not see any dates, but I did see it dropping steeply after reaching the top so I am expecting to see that soon. Depending on how much it drops at the opening bell that might still be the best prices we see all week because I believe I saw it drop below 17,000. In a separate vision, I saw a graph showing it recovering maybe half of the drop, but there were no numbers in that vision. Hi James, I am probably way off here but I wonder if that drop with a partial retracement you saw was the bigger picture of the steep drop into May/June and then partial rally into July with a drop back down into the Fall. I agree. Without seeing dates or numbers it is challenging to know where it applies. I kept thinking it was pre-crash, but this morning I saw a green 220, which I believe means we will be going up another 220 points from where we closed Friday. It is already about half way there since we moved up 106 today. Does this mean when you heard 2 higher closes and saw 1850 for being a high you weren’t hearing God? Not throwing any stones but trying to understand. I feel very confident I received those things from God, but like I said, I believe He is bringing us together as a body rather than isolated parts. Hi folks, you all may already be familiar with this site, but if not, you may want to check out the world cycles institute. I can’t speak for the credibility of the information, but the author seems to know what he is talking about. I first heard of this site when it’s founder, Peter Temple, was interviewed by Rick Wiles on TruNews. The market analysis is heavy in Elliot Wave theory and is absolutely fascinating to me even though I am admittedly still new to technical analysis. Peter Temple puts out a free weekly market analysis every Sunday. His forecast seems to be right in line with what we are all anticipating. Interestingly enough, he titled today’s weekly forecast, “The Second Coming.” Here’s the website – would value any feedback on the information there: http://worldcyclesinstitute.com/the-second-coming/. Be encouraged my brothers and sisters in Christ, I so appreciate your encouragement as I am holding on believing we are finally beginning a turn down. Right on, Brother. I also heard him on Rick Wiles. Very interesting analysis!!! a large quake and the nation was divided. Just sayin’.